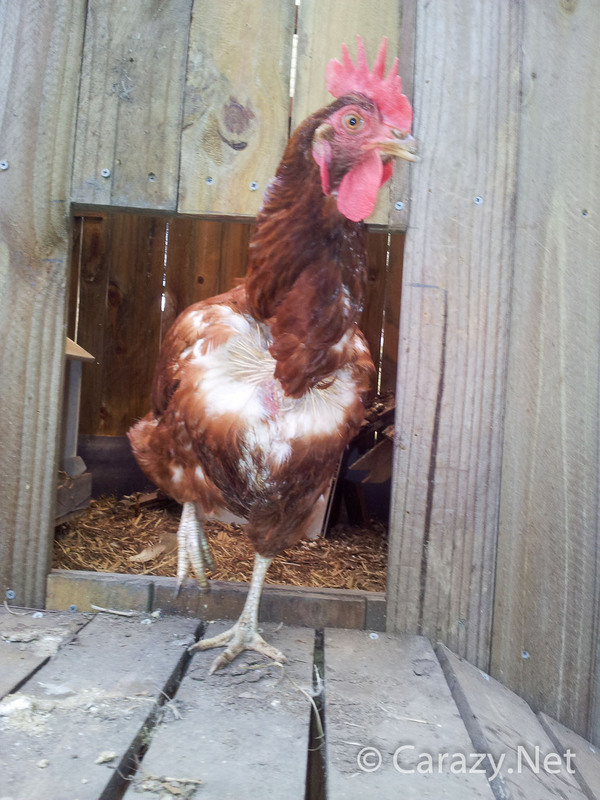 Lumpy the Chicken’s journal of her adventures at the carazy permaculture experiment. Woke up in a weird place. This is not the big tin shed. The other chickenladies are a little confused as well. There’s a milk crate blocking us from leaving the coop put there by our simpleton human that we’ve recently acquired. He thinks we need to get used to our little home and that we’ll be using the lovely nesting boxes he’s built for us. I can tell you now that none of us are in the mood to lay eggs today. Moving house is far too stressful! Also we want food dammit. All he’s left us with is a big bucket of rainwater which, while delicious, is not something we’re interested in right now. It’s about bloody time that lazy man arrived. I’ll be leaving a complaint at the front desk regarding this tardiness. The girls and I are squawking our disapproval about this lock-in and he’s just laughing. He’s just checked and there’s no eggs so the laugh’s on him, hah. Our human moved the milk crate out of the way but the other chickenladies are super scared of everything. As for me, I’m outta here and heading to the buffet, that green stuff growing on the ground tastes amazing. It’s so different to the pellets we’ve existed on till yesterday plus it’s all you can eat. The human has opened up the big side doors to the coop and shooing the other girls out. I have no idea why they’re taking so long. This is one of them dawdling at the door. Now the human is staring incredulously at the massive pile of poop where we were sleeping in the corner. Humans are weird. The human came down from the blue building where I think he sleeps and he’s brought some tubs of something called home made yoghurt , mixed with sunflower seeds and molasses. Dear sweet baby Jesus this tastes so fricken good. The girls are literally burying their heads in it then flicking it everywhere when they realise their heads are coated in the gooey delicious mixture. The human is laughing at how greedy we’re acting. I mean some of the girls are actually standing in the tubs to stop others from getting to it. It’s almost embarrassing. Also he’s now coated in the mixture from us flicking it everywhere. While the others fight over the remnants I’m sidling up to the human to suss him out. What’s his story? Where did he come from. What are his intentions with us and does he have more treats for me? He keeps reaching down to touch us but we’re far to quick for that. I keep teasing him by going up and rubbing against his legs then running away when he reaches down. The other ladychickens just keep well away. As for me, I’m going to follow him and find out more about this strange being who’s taken us under his non-feathery wing. He’s spending an inordinate amount of time watching us do our thing while he does his building stuff. He however keeps shooing us away while he’s working. If he doesn’t want us to to stick our beaks into what he’s doing, why does he keep doing interesting stuff? The human has a lamp on his head and he’s walking around trying to find sleeping chickens. Once again we’ve all just plonked down wherever we were standing when it went dark and not a single on of us entertained the idea of heading to the nice big house. He’s scooping us up and putting us in the nice straw filled coop. I like getting tucked in. We’re a little sleepy while he does this and make soft cooing noises which I think he likes. One of the girls managed to find a sleeping spot under the piles of timber in the run. The human isn’t enjoying reaching for her and as a result she’s started squawking so naturally now we’re all wide awake. Our chicken pile in the corner is providing him with a great deal of amusement. Little does he know that we’re not merely climbing onto each other for the sake of it. There’s an intricate chicken pile-on system that’s instinctively ingrained in us, but to the untrained eye I guess it can look like a bunch of stupid chickens sitting on each others’ heads. He still hasn’t given us names. I heard that they don’t do that when we’re destined for the dinner plate. I really hope that’s not the case. Are all those delicious treats to fatten us up? Anyways time to sleep, and sleep-poop. Things are chaotic here at the egg farm. A whole bunch of us have been moved over the last few days to special holding cages and and there’s a lot of gossipy clucking going around as to why. Word in the shed is that we’re off to some place called the “Shopping Block”. Hooray, I love shopping! There’s been a lot of cars coming and going all day. Small groups of us are taken and shoved into all manner of boxes and cages. I’m guessing that’s how they’re shuttling us to the shops. Oh dear, talk about Chinese whispers gone wrong. It’s the CHOPPING block, not the shopping block! I now have no idea if I really want to get into one of those cars, my small world is in turmoil. 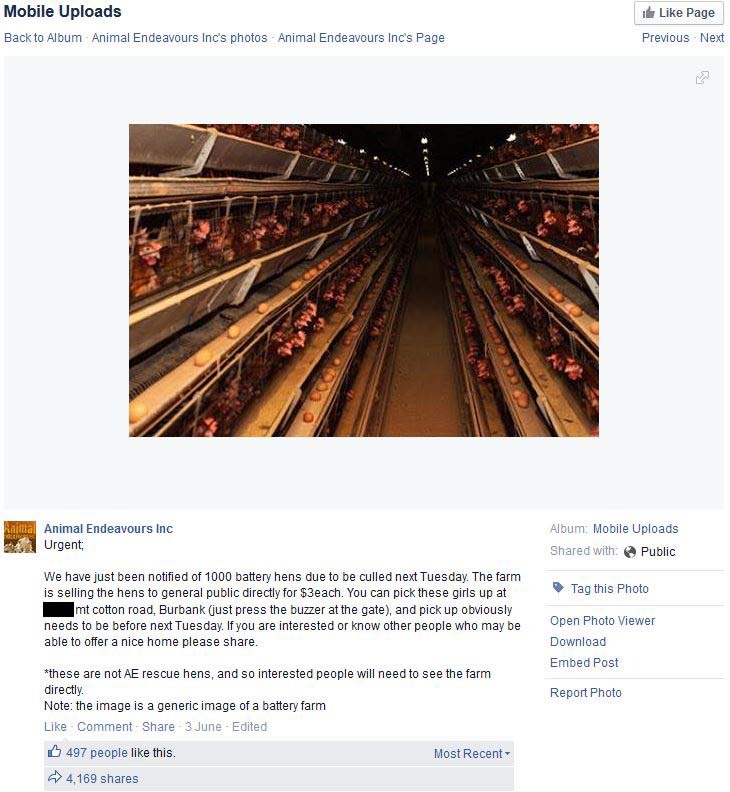 The good news is that someone put this appeal on something called FaceSpace or something and and it went viral and the egg farm owners certainly didn’t expect to be run off their feet loading chickens in cars all day. There’s a good chance a lot of us ladychickens may get an opportunity to prove that we’re not past our use by date. Wings crossed, I’m hoping I’ll be one of them. The family that owns us supplies bulk eggs but also sell eggs direct to the public from a little shop out the front of their house. I can hear the farm employees complaining that they’ve been run off their feet constantly loading chickens into cars since 9am without a break. The workers keep saying to the arriving humans that they’re running out of chickens. What about me? I’m a chicken. Oh dear this is highly stressful. Okay now I’m ready to lose what remains of my feathers. All the other girls are getting new homes and I’m still here and it’s late in the day. An old red car has pulled up and a big scary guy with a beard has climbed out and is joking around with the workers. They’re impressed with his DIY milk crate chicken carrying cases. He’s telling them he saw the posting and then realised he had no way to transport six chickens back to his house. 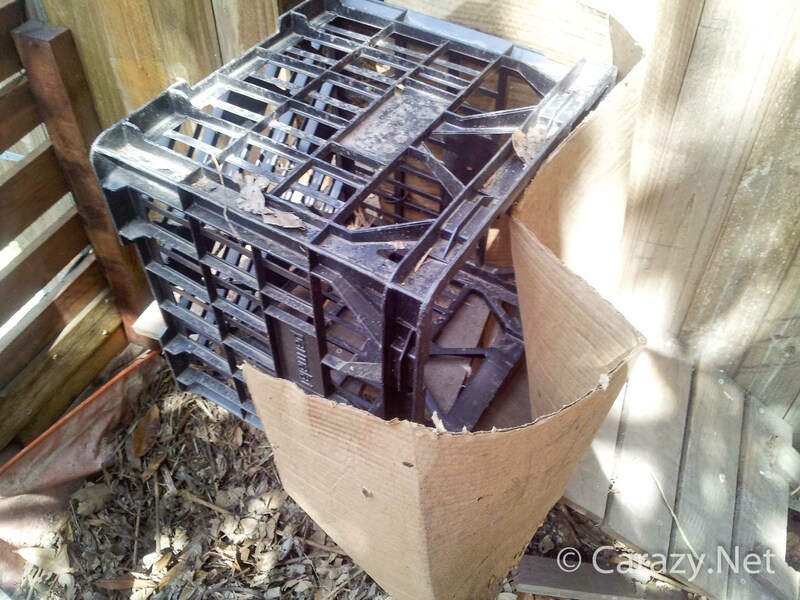 So he zip-tied a long piece of cardboard on one side of the milk crate to make a door. 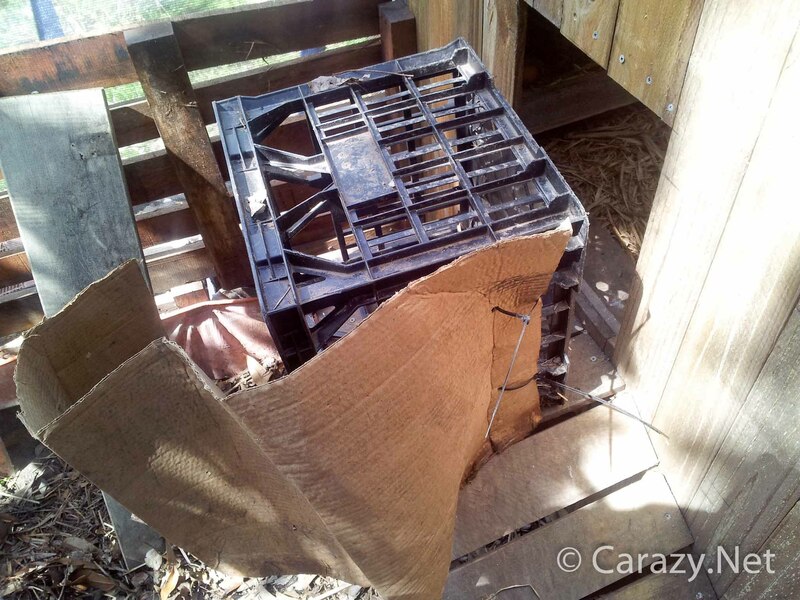 Once the crate was loaded he could zip tie the other end and enclose the crate. He also put a piece of cardboard on the base to act as a floor. Eeek! I’m hanging upside down by my legs. Oh no it’s the end. I hear this is how you’re carried to the cone of death. The old biddy nest to me is squawking like there’s no tomorrow and perhaps she’s right. I hope it’s quick. Ooooh, I’m right way up again and it would seem I’m in one of those milk crate things with my squawking friend. 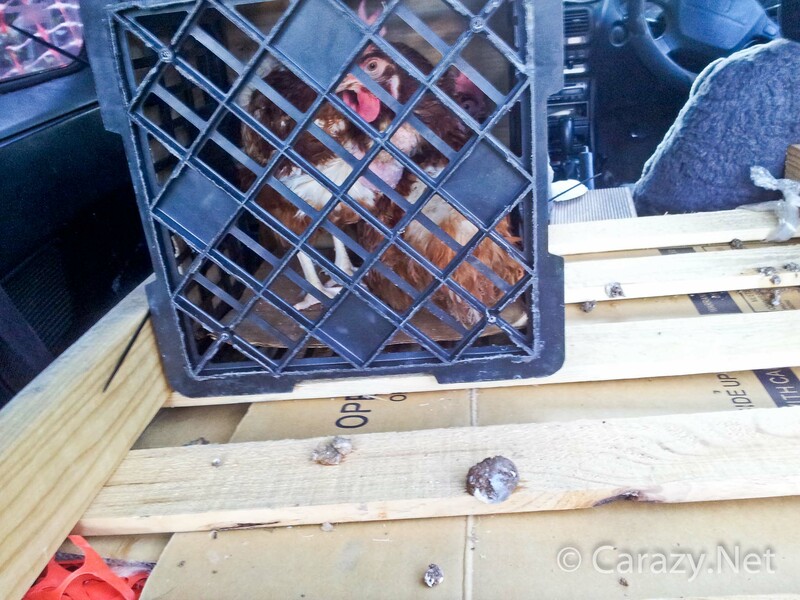 The red car man brought six crates but the workers here figured we’d be fine two to a crate. There’s plenty of room and it’s kind of nice to have someone in here with me. My feathers got a little ruffled when I saw him pay the workers $18 for the six of us, I mean really, $3 each? I’m worth so much more than that. This driving thing is fun. I tried asking where we’re going but every time I stuck my head up through the gap to look around and let out a “Buuuuurk”, the bearded man would have a fit of laughter. We’ve obviously been left in the care of a simpleton, this does not bode well. The car ride took nearly an hour so he’s driven a long way to get us. I’m so glad we were two to a crate as it minimised getting jostled around. Our new human finally took us out of the car. That’s me staring at the camera however I think he took the photo because he’s astounded at the size of the poop one of the girls did. Has he not seen the size of eggs? Boy is he in for a surprise. Perhaps he’s not such a simpleton after all, as he did lay down a lot of cardboard underneath us. Oh my, this is a little bit posh. The other ladychickens are running around everywhere all excited, they don’t know what to make of it. Our human has given us a mansion to live in! I believe they call it a ‘Coop’, how fancy. Floorspace is roughly 3m2 (~32ft2 for those chickens who haven’t evolved to the metric system) and that’s just the house! 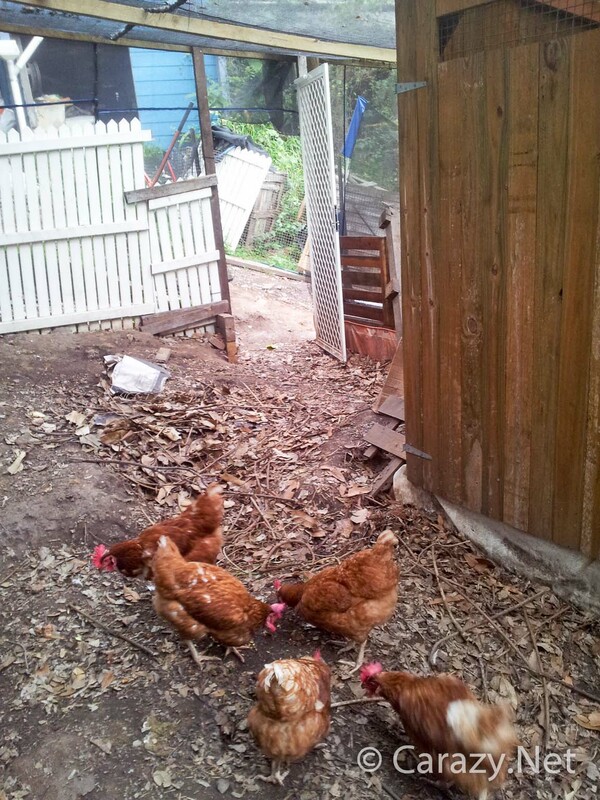 Our private protected yard is about 18m2 (~200ft2) so I’m wondering where the other 100 hens are hiding? Surely all this isn’t just for us six ladychickens? I can hear our human talking on the phone to a friend. He’s saying he can’t understand how the cheapest breed like an ISA Brown (That’s me!) at point of lay for a backyard costs ~$18/ea while a fully reared meat chicken is grown to size, sent to an abattoir, processed, packaged, transported to the shops and sold at a profit for under $10. Even my basic chicken math tells me there’s something askew there. He’d better not be working out if I’m economically tasty! Fortunately I think he’s just stoked he got six for the price of one. 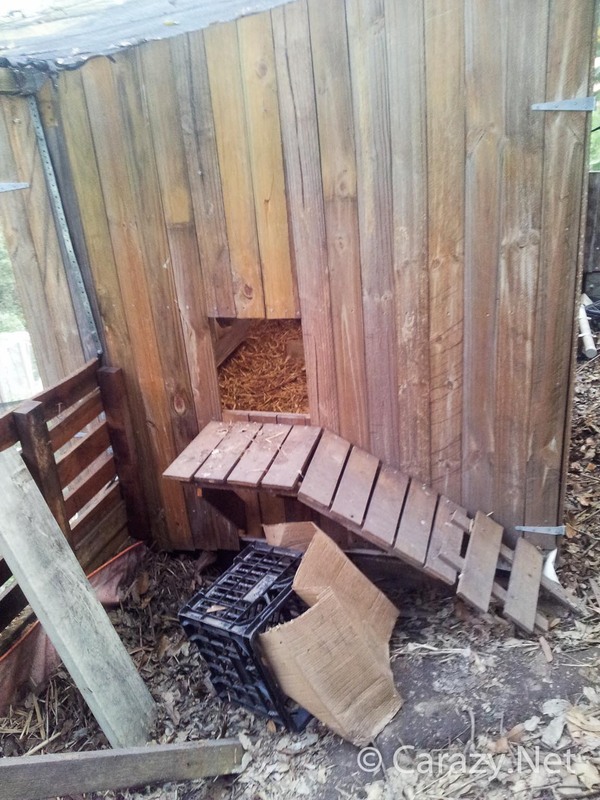 Now he’s waffling on about how this purchase was all so sudden and he hasn’t completed work on the coop. Whatever, I’m going to go forage through this weird green stuff on the ground while the human stuffs around with his drill making ramps for us to get to the front door. So it’s dark and in the tin shed we lived in that means we simply put our bums on the ground and go to sleep. The human is confused and is wondering why we aren’t heading to the coop. He’s now walking around picking up us girls from under pipes, inside milk crates, on top of pallets and wherever it was we plonked down, where we were standing, when it became dark. It would seem he’s tucking us in and putting us in the coop. How sweet. It’s nice in here with this thick bed of sugar cane mulch under us. It is a little bit scary so despite all this space, the girls and I are huddling in a giant chicken pile in the corner. Goodnight Diary. It’s been an epic day and it’s time to dream of butterflies and chomping down on them. I hear that some humans give their chickens names. I can’t wait to find out mine. I’m sure it’ll be something exotic like Jasmine or Scarlet (I am a redhead)!